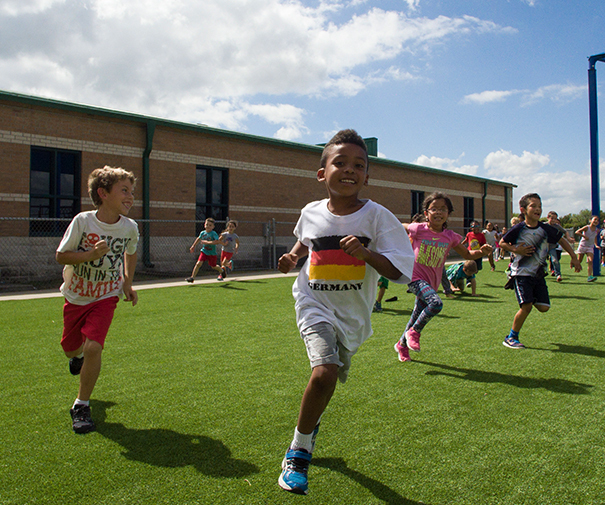 Kids are racing outside to play on the Kickabout™ field, a new, customizable play surface that allows children to safely participate in a wide variety of sports and activities in any weather, without the worry of potholes, mud, tall grass and weeds. Hellas provides this flexible and affordable option for sports, play, and overall well being for schools, daycares, or activity centers with limited space or finances. Kids can’t get enough of this fun-packed playground and mini-sports field. Kickabout brings together activities – including soccer, funnel ball, hopscotch, tetherball, and running lanes- into one fun-packed playground and mini-sports field. Kickabout elevates the level of any fitness or wellness program, while exciting children and driving them to be more active everyday. Kickabout offers many benefits for those looking for their next playground. With a focus on increasing health awareness and facilitating physical education, a Kickabout ensures that children of all ages have a beautiful, safe, and enjoyable recreational place to play. With unlimited advantages for project owners, educators, and children, Kickabout gives “playground” a new meaning! CHOOSE YOUR SIZE • CHOOSE YOUR COLOR • CHOOSE YOUR FUN! 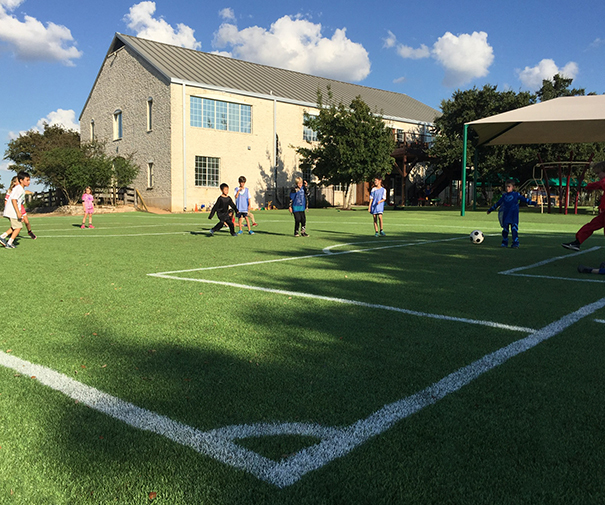 A Kickabout customized play surface can be as small as 2,000 sq.ft. or up to 20,000 sq.ft. and fits into existing landscapes. By combining intelligent design and the best synthetic turf in the industry, a Kickabout offers immense flexibility and endless customizable options. No matter the size of the space, you can custom design Kickabout to fit your needs. The uniquely designed Kickabout playgrounds come in all shapes, sizes, and colors, with a solid foundation of the best sports turf on the market, and environmentally friendly materials. Kickabout is sure to get kids up and active while keeping them safe and healthy. Physical activity is an essential component of a healthy lifestyle for everyone, especially children. Today’s youth spend an average of 7.5 hours consuming media daily- watching TV, listening to music, surfing the Web, social networking, playing video games, and decreasingly less time engaging in physical activity. 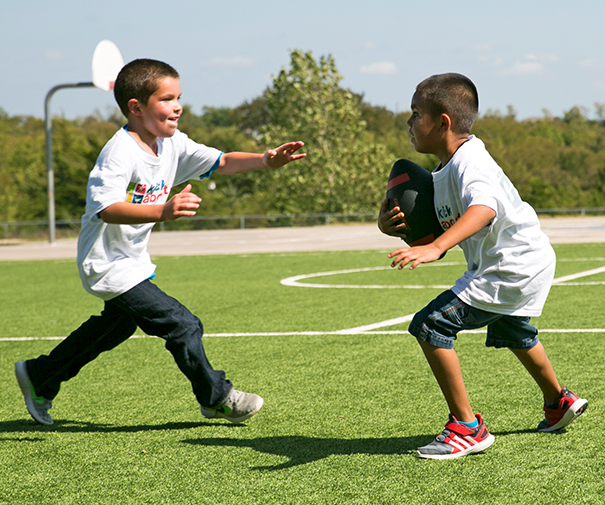 By providing a safe, reliable surface for games, sports, and activities, the Kickabout field helps children of all ages reach the 60 minutes of daily activity recommended for optimal adolescent health. The Kickabout playing surface excites and drives children to play and be active everyday, creating a foundation for an active and healthy lifestyle.